After a week of torrential rain, I finally got to spend some time in the garden weeding, clearing out bolting cool-weather crops, and filling in a few new sections for fall harvest. 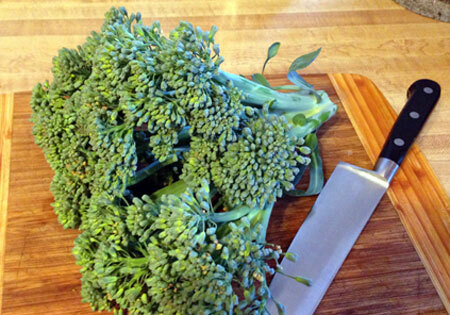 My broccoli heads are all just about ready to harvest—I brought in the largest one, which looked like it was thinking about flowering, and decided to show it off in a stir-fry recipe with chicken thighs. My favorite go-to dish to order at Chinese restaurants is sesame chicken, the one with crispy battered chicken and a sweet-spicy glaze. Obviously I have not been able to eat this since going gluten-free, but no more! Garbanzo bean flour makes an ideal coating for fried chicken tenders or fish sticks, either tossed with the meat dry or mixed with water for something like a pancake batter consistency. 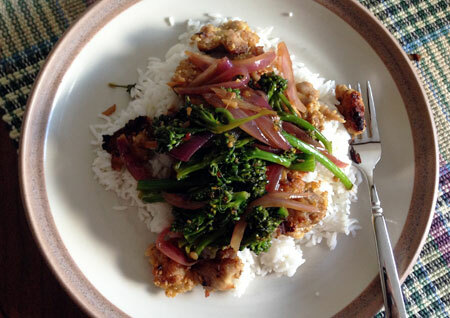 Here, I combined the garbanzo bean flour with sesame seeds, and ended up with crunchy, savory chicken nuggets that are tasty on their own but even better topped with stir-fried broccoli and spicy-sweet sauce. Honestly, I think this version of sesame chicken is superior to all of the wheat flour versions I have tried in the past—I had zero trouble with the coating coming off at any point in the process, and the flavor and texture was perfect. Below I have listed minimal adjustments to the original recipe, but I actually used pre-reduced chicken stock concentrate rather than boiling it down on the spot, and made my sauce from tamari, Ginger People’s sweet ginger-chile sauce, sesame oil and a teaspoon of organic cornstarch to thicken it up—these just happened to be the choices I had available in my fridge. I chose simply to top the chicken with broccoli, onions and sauce on the plate rather than adding it to the skillet first, in hopes of keeping the texture crispy—this approach worked nicely. For basic kid-friendly chicken nuggets, just make the nuggets and leave off the trimmings. These also reheat nicely in the oven, maintaining their crisp exterior without getting flabby; using chicken thighs rather than white meat also helps maintain some moisture if you intend to reheat. Preheat the oven to 350°F. In a large bowl, season the chicken with salt and pepper; mix garbanzo bean flour and sesame seeds in a large bowl and toss chicken in to coat thoroughly. Coat a large skillet with avocado oil. Add the chicken in an even layer and cook over high heat, undisturbed, until browned on the bottom, about 3 minutes. Turn the chicken and cook until browned on the second side, about 2 minutes. With tongs, transfer the chicken to a rimmed baking sheet and put it in the oven while you finish the dish. In the oil remaining in the skillet, cook the ginger, garlic and crushed red pepper over moderately high heat until fragrant, about 2 minutes. Add the chicken broth and boil over high heat until reduced by half, about 4 minutes. Add the broccoli, cover and cook until bright green and crisp-tender, about 2 minutes. Stir in the oyster sauce, season with salt and remove from the heat. Gently stir in the chicken and sesame oil and serve with steamed rice. Update 11/4/14: I made this again last night with a different improvised sauce: tamari, Ginger People sauce, toasted sesame oil, rice wine vinegar, garlic powder and a bit of cornstarch. It made a nice sweet sticky glaze with some heat, and I served it with a side of stir-fried cabbage (cut in big squares), carrots, onions and garlic.